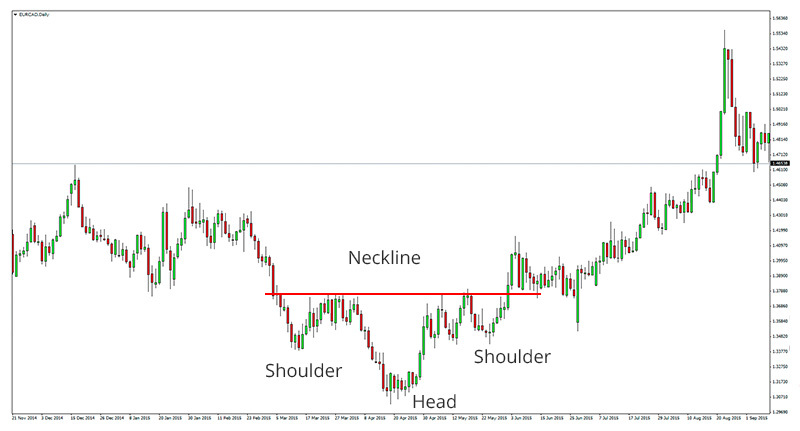 The head and shoulders pattern can be either head and shoulders, top or head and shoulders bottom. The Charts are a picture of a head and shoulders movement, which portrays three successive rallies and reactions with the second one making the highest/lowest point. head, right shoulder, and neckline. Other parts playing a role in the pattern are volume, the breakout, price target and support turned resistance. Lets look at each part individually, and then put them together with some example. reversal pattern. Without a prior uptrend to reverse, there cannot be a head and shoulders reversal pattern, or any reversal pattern for that matter. which volume is quite heavy. At the end of the left shoulder there is usually a dip or recession which typically occurs on low volume. high and marks the top of the head. At this point, in order conform to proper form, prices must come down somewhere near the low of the left shoulder somewhat lower perhaps or somewhat higher but in any case, below the top of the left shoulder. The right shoulder is formed when the low of the head advances again. The peak of the right shoulder is almost equal in height to that of the left shoulder but lower than the head. While symmetry is preferred, sometimes the shoulders can be out of whack. The decline from the peak of the right shoulder should break the neckline. the right shoulder. A breaking of this neckline on a decline from the right shoulder is the final confirmation and completes the head and shoulder formation. confirmation. Volume can be measured as an indicator (OBV , Chaikin Money Flow) or simply by analyzing volume levels. Ideally, but not always, volume during the advance of the left shoulder should be higher than during the advance of the head. These decreases in volume along with new highs that form the head serve as a warning sign. The next warning sign comes when volume increases on the decline from the peak of the head. Final confirmation comes when volume further increases during the decline of the right shoulder. Once support is broken, it is common for this same support level to turn into resistance. Sometimes, but certainly not always, the price will return to the support break, and offer a second chance to sell. After breaking neckline support, the projected price decline is found by measuring the distance from the neckline to the top of the head. Price target is calculated by subtracting the above distance from the neckline. Any price target should serve as a rough guide, and other factors such as previous support levels should be considered as well. * The head and shoulders pattern is one of the most common reversal formations. It occurs after an uptrend and usually marks a major trend reversal when complete. * It is preferable that the left and right shoulders be symmetrical, it is not an absolute requirement. They can be different widths as well as different heights. * Volume support and neckline support identification are considered to be the most critical factors. The support break indicates a new willingness to sell at lower prices. There is an increase in supply combined with lower prices and increasing volume .The combination can be lethal, and sometimes, there is no second chance return to the support break. * Measuring the expected length of the decline after the breakout can be helpful, but it is not always necessary target. As the pattern unfolds over time, other aspects of the technical picture are likely to take precedence. For this to be a reversal pattern it is important to establish the existence of a prior downtrend for this to be a reversal pattern. There cannot be a head and shoulders bottom formation, without a prior downtrend to reverse. volume. While in a downtrend, the left shoulder forms a trough that marks a new reaction low in the current trend. After forming this trough, an advance ensues to complete the formation of the left shoulder. The high of the decline usually remains below any longer trend line, thus keeping the downtrend intact. After the formation of the left shoulder, a decline begins that exceeds the previous low and forms a point at an even lower point. After making a bottom, the high of the subsequent advance forms the second point of the neckline. Right shoulder is formed when the high of the head begins to decline. The height of the right shoulder is always less than the head and is usually in line with the left shoulder, though it can be narrower or wider. 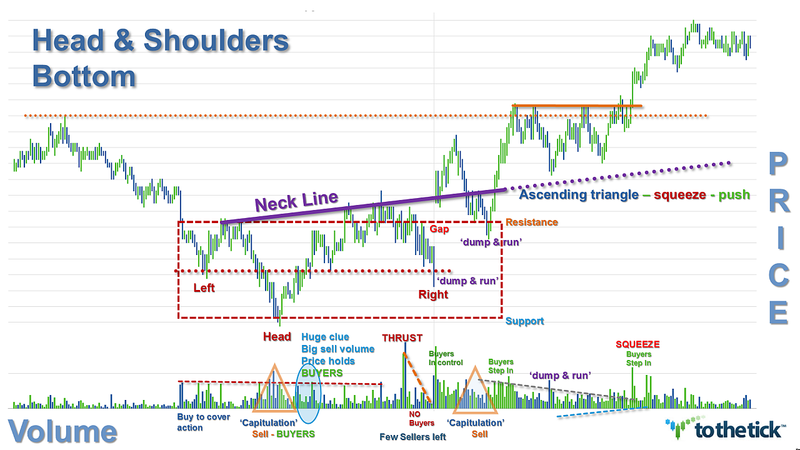 When the advance from the low of the right shoulder breaks the neckline, the head and shoulders reversal is complete. The neckline is drawn through the highest points of the two intervening troughs and may slope upward or downward. The neckline forms by connecting two reaction highs. The first reaction marks the end of the left shoulder and the beginning of the head. The second reaction marks the end of the head and the beginning of the right shoulder. Depending on the relationship between the two reaction highs, the neckline can slope up, slope down, or be horizontal. The slope of the neckline will affect the pattern’s degree of bullishness: an upward slope is more bullish than downward slope. Volume plays a very important role in head and shoulders bottom. Without the proper expansion of volume, the validity of any breakout becomes suspect. Volume can be measured as an indicator (OBV, Chaikin Money Flow) or simply by analyzing the absolute levels associated with each peak and trough. Volume levels during the second half of the pattern are more important than the first half. The decline of the volume of the left shoulder is usually heavy and selling pressure is also very intense. The selling continues to be intense even during the decline that forms the low of the head. After this low, subsequent volume patterns should be watched carefully to look for expansion during the advances. The advance from the low of the head should be accompanied by an increase in volume and/or better indicator readings (e.g. CMF > 0 or strength in OBV). After the formation the second neckline point by the reaction high, there should be a decline in the right shoulder accompanied with light volume. It is normal to experience profit-taking after an advance. Volume analysis helps distinguish between normal profit-taking and heavy selling pressure. With light volume on the pullback, indicators like CMF and OBV should remain strong. The most important moment for volume occurs on the advance from the low of the right shoulder. For a breakout to be considered valid there needs to be an expansion of volume on the advance and during the breakout. The head and shoulders pattern is said to be complete only when neckline resistance is broken. For a head and shoulders bottom, this must occur in a convincing manner with an expansion of volume. The same resistance level can turn into support, if the resistance is broken. Price will return to the resistance break and provide a second chance to buy. by measuring the distance from the neckline to the bottom of the head. This distance is then added to the neckline to reach a price target. Any price target should serve as a rough guide and other factors should be considered as well. These factors might include previous resistance levels, Fibonacci retracements or long-term moving averages. * Head and shoulder bottom is one of the most common and reliable reversal formations. They occur after a downtrend and usually mark a major trend reversal when complete. * It is preferable but not a necessary requirement that the left and right shoulders be symmetrical. Shoulders can be of different widths as well as different heights. If you are looking for the perfect pattern, then it will take a long time to come. * The major focus of the analysis of the head and shoulders bottom should be the correct identification of neckline resistance and volume patterns. 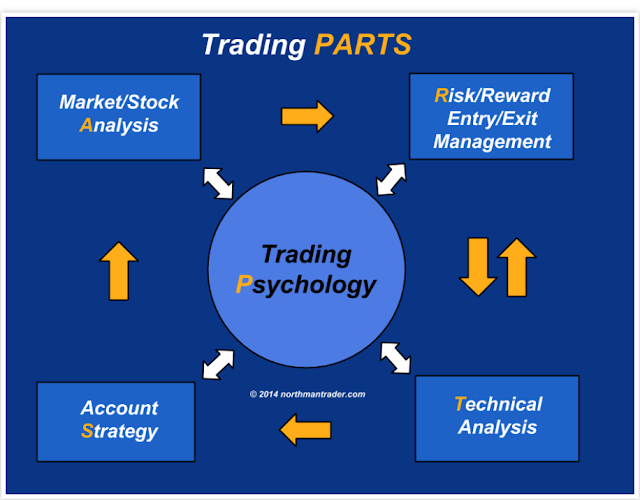 These are two of the most important aspects to a successful trade. The neckline resistance breakout combined with an increase in volume indicates an increase in demand at higher prices. Buyers are exerting greater force and the price is being affected. * As seen from the examples, traders do not always have to choose a stock after the neckline breakout. Many times, the price will return to this new support level and offer a second chance to buy. Measuring the expected length of the advance after the breakout can be helpful, but it is not always necessary to achieve the final target. As the pattern unfolds over time, other aspects of the technical picture are likely to take precedent.